Here’s a Billy Cobham tune from his 2008 album Fruit from the Loom, which includes Junior Gill on tenor pan. I “cut my teeth” playing cello pan in a steel band, and wish steel drums were heard on more jazz albums. A few Jaco Pastorius records feature the great Othello Molineaux, but in general steel drums have been neglected in the world of jazz. The pan has untapped potential as an “idiophone”, an instrument that vibrates as a whole (as opposed to “membranophones” (drums and larynxes), “aerophones” (horns and reeds), and “chordophones” (strings and pianos)). In most jazz bands, cymbals are the only idiophones. Sometimes vibraphone or clave is added to the mix, but I feel pan is just as legitimate as these to add interesting timbres to jazz compositions. I first heard this tune on the radio while driving home from a late-night gig, and I’m not sure yet how much I like the composition, but the steel pan and the Latin-inspired solo sections caught my ear enough to transcribe it. 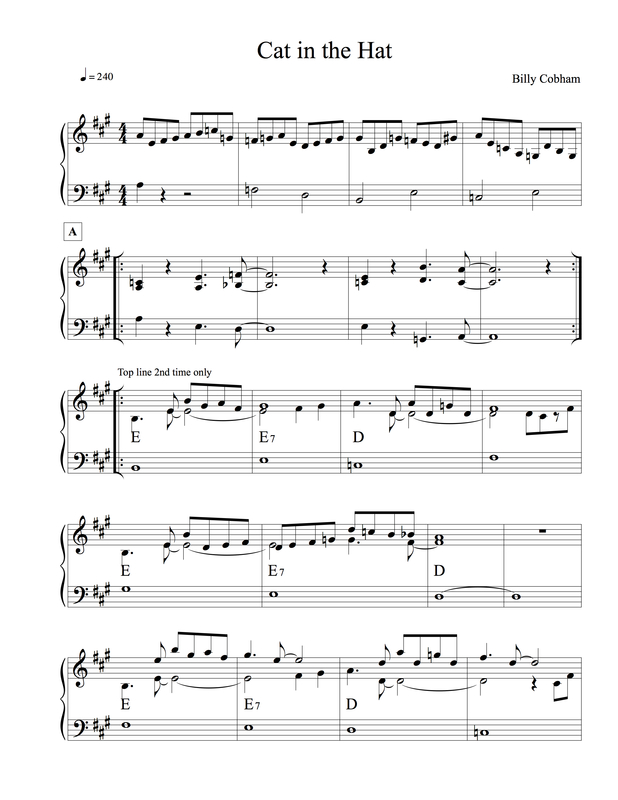 This entry was posted in Uncategorized and tagged Billy Cobham, Cat in the Hat, jazz, lead sheet, music, Noteheads, transcription on January 23, 2015 by noteheads.